This evening, chicago-lookups, a go-to person for early Chicago vital records now that I'm a sun-warmed, ocean-cooled Californian, wrote to ask me what to do in a case where there are no apparent matches in any of the available indexes for the name and the death date that her client provided. As my reply to her grew longer and longer, I realized that my answer might be useful to a wider audience. Blog post time! 1) Check the Illinois Statewide Death Index, Pre-1916 using Stephen Morse's One Step approach. Search the given name and surname, as provided. Search the given name and surname, leaving off letters. For example, use Mar... if the name is Mary, Maria, Marianna, Marianne, Martha, Marta. Use Ab... Abraham just in case the name is in the index as Abe. You get the idea. Also try just the first letter of the given name. Search the surname with the death year. Search the given name with a year, if unique. Add a few letters of the surname, if it isn't. Check alternate years--a "3" could be misread as an "8" for example. 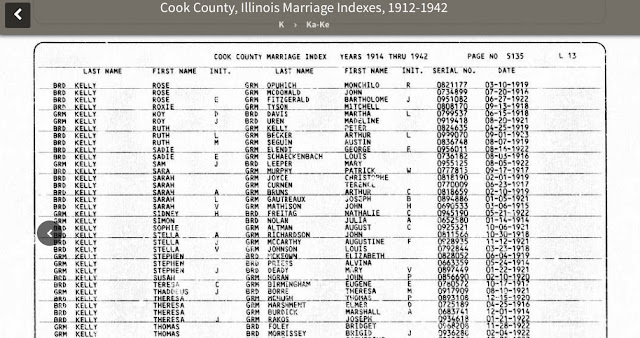 2) Check the Illinois, Cook County Deaths, 1878-1939, 1955-1994 index at FamilySearch. Remember, though, that the names of parents or spouse won't be useful in searching for records before c. 1908. The early forms didn't ask for that information. 3) Check the Indexes to deaths in the city of Chicago during the years 1871-1933: showing name, address and date of death (also called the "burial permit index"). It's on Family History Library microfilm. It includes out-of-town deaths and sometimes names don't appear in the indexes mentioned above because a Chicago resident died outside the area. Look for a way to confirm the death date and place. 4) Check for an obituary in the Chicago Tribune online. Some libraries offer access or you can get to it through Fold3. 5) Check for an obituary in other Chicago newspapers. If you don't have access, Genlighten's mollykennedy is a pro at finding Illinois obituaries using the resources that are available in Springfield. 6) If you have an idea where the person was buried, contact the cemetery to see if you can find a burial date. Ask if they have information similar to what might be on the death record. 7) Check the Cook County Coroner's Inquest Index, 1872-1911. Remember, this is a pull-out-all-the-stops search. It's worth a try. 8) Scroll through the Family History Library film where the record you're looking for should be. Use the One Step index linked above to search for a person with the same first letter of surname who died the same month and year as the person you're looking for. Use that certificate number to choose the Family History Library film that would have that record. Early death records are arranged in a logical way. All of the "K" deaths for January 1894 will be grouped together, for example. Starting from the record you identified using the index search, scroll back to find where the "K" records for January start. Look through one at a time until you come to "K" records for February. 9) Repeat the process described in #8 using a film from the Cook County (not city) series. 10) Mail in a search request to the Cook County Clerk's Office to see what they can find. 11) Look for the death in other places. For example, an elderly parent might have gone to stay with an out-of-state child during a last illness. 12) See if there's a church burial record, especially relevant for Catholic deaths as many of those records are on Family History Library film. If none of those approaches work, you might be out of luck, but I never say never. You might stumble on the record you're looking for in an unexpected place--a pension file, for example? Or? What other ideas come to mind? When I was actively pursuing Chicago research, I sometimes searched the ProQuest version of the Chicago Tribune when I wanted contemporary insights into the workings of, say, the vital records office. Organizing files earlier today, I came across a copy of an 1878 article titled "The County Building" which included a paragraph suggesting that the County Clerk was a bit timid about taking action to force ministers and physicians to report births, marriages, and deaths. If you've been looking for a record that doesn't seem to exist, this might be why. My feeling, though, based on thousands of searches, is that most marriages and deaths were probably recorded (although sometimes marriage licenses were obtained but never returned) but that births were often overlooked. Almost a year ago I received an email from someone asking for my help to obtain a certified copy of a Chicago death certificate from 1910. When someone needs a record that can only be obtained from the Cook County Clerk's Office, I usually suggest contacting the office directly but in this case the circumstances were such that I thought it would be best for someone to obtain the record in person. I offered to make the trip as part of my continuing education because I'd never been to a satellite office before. I visited the Skokie office on September 11. The clerk tried very hard to find a digital copy of the record in her computer system for me, but had no luck. I left a by-mail request. After a few weeks of waiting, I called. The request was still in the system but the clerk couldn't tell me when it might be processed. As the six-week mark approached, I emailed to check on the request. I got an immediate response and the record arrived three days later. On September 11, I took an uncertified copy of the death certificate that I needed to obtain and visited the Skokie office. The first challenge was finding the right building. I'm usually a bus rider and so I pulled in the lot where the bus stops are. Nope. The parking garage is east of that. It took me a while, but I found it. I knew that there would be strict rules about what could be taken into the building--no cell phones, for example--and so I carried just a few things--my ID a few papers, money, and my keys--in a clear plastic case. I make it through security in a breeze. In fact, they didn't even send my case through the scanner. Once I was through security, I walked down the hallway to the right and found the Vital Records room on the left. There were only a couple of people ahead of me. I wasn't quite sure where to wait--stand in line or take a seat?--but it wasn't too long before a clerk called me over. She took my request and did a thorough search of her online database trying to find a match for the record so that she could provide a certified copy immediately. She used wild cards and even looked at births just in case the record had been entered wrong. Unfortunately, she just couldn't find a digitized copy of the record and so I had to leave a by-mail request. She created the request form on her computer and printed it out for me to sign. I said, repeatedly, that it needed to be a certified copy. She didn't put that in the note but she assured me that saying it was "needed for dual citizenship" would tell whoever prepared it for mailing that it should be certified. The bottom of the form asked for my relationship to the deceased and I put "none." She said that wouldn't work. She gave me a new form and I wrote something like, "Agent for grandson of the deceased." And then I went home and waited, watching my mailbox every day. After a few weeks, I called the Skokie office. I was able to confirm that the request was still in the system (I provided the surname and the clerk pulled it up and mentioned the given name so I know it was there) but the person I spoke to had no estimate of when I could expect the record. Her comment was just that the record was old. On the surface, that seemed to be an odd way to answer my question, but it's possible that it is more difficult for them to pull early records and it's possible that it takes a while for them to find the time to do it. Can you give me an idea of how long it will be before our request will be processed? Or, if the record has been mailed, can you tell me when it was sent? If it hasn't been mailed, do you need anything else from my clients in order to process the request? I was worried that the relationship information might be holding things up and I didn't want to have to start the process again. Three days later, I had the record and dropped it in the mail to my client the next day. I don't have a lot of experience working with the Cook County Clerk's Office and so I don't know if this turnaround time is typical or not. The few times I've requested marriage licenses, it seems like they've come quicker. Satellite offices can provide vital records to in-person visitors immediately if the records are in the computer system. Good to know! If a record isn't in the system, you'll have to leave a by-mail request. There's no way to know ahead of time but I'm guessing old record means not much chance and on-cookcountygenealogy.com means pretty certain. The request form asks for relationship to the deceased. If you need a recent certificate and you're not someone who can legally obtain the record, I believe (based on a previous successful experience) you'll need a notarized document authorizing you to act as an agent for the person, copies of documents proving that person's right to the record, and personal identification. Call ahead for more information, if you find yourself in that situation. Requests made in person go into the system immediately so they can be tracked. I liked that. It probably happens with mail-order requests, too, but I'm not sure. It might take a bit of patience to get a record. It's worth following up if a record doesn't arrive in a timely way. A polite inquiry by email will likely get a pretty quick response. Overall, except that it seemed to take much longer than expected to get the record, I'd say the experience was a very positive one. 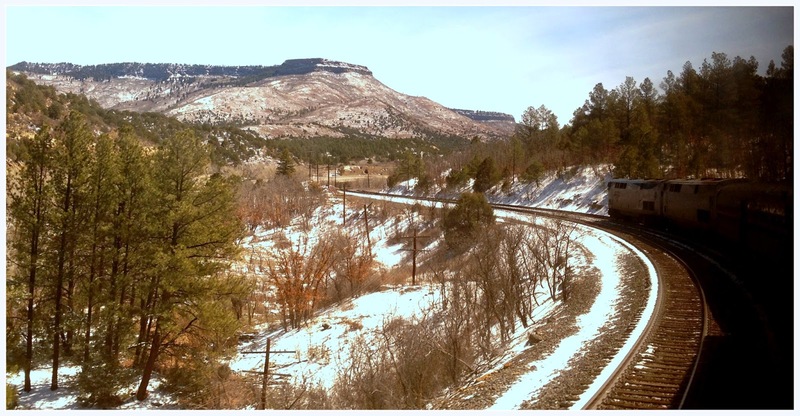 Last week I closed the door to our Wilmette home one last time, climbed aboard the Southwest Chief out of Chicago's Union Station, and forty-three-or-so hours later I arrived in Los Angeles ready to experience life as a Californian! My husband's work has brought us to west coast and we have officially moved. So, what does that mean for ChicagoGenealogy? First, that it's time to pass along the document retrieval work that I've been doing for nearly twelve years to others. I've arranged for Khania, a new researcher who has easy access to the Wilmette Family History Center, to take over birth, marriage, and death record lookups. I've shared with her much of what I know about Chicago research and she's a quick learner! That part of my work is in good hands. You can find her as "chicago-lookups" on our Genlighten site. There are many others who are skilled at the divorce, probate, and naturalization searches that I did at the Cook County Circuit Court Archives and a number of those researchers can be found on Genlighten. Kim Stankiewicz's services most closely mirror my own--I've enjoyed the times we've found ourselves at the Daley Center at the same time, putting our matching scanners through their paces side by side--and so I will be referring my previous clients to her. At the moment, my plan is to continue to maintain the ChicagoGenealogy website and I'm hoping to find time in the near future to make some much-needed updates. Chicago research strategy changes with additions and subtractions to websites like FamilySearch and Ancestry and I want to make sure the information presented is current. I will also be removing the first person voice from the site, remaking it into a cooperative rather than an individual endeavor, and that brings me to the blog. I will continue to add to it, but I would like to invite other local researchers to use it as a forum for sharing their own insights into Chicago and Cook County research. If you would be interested in guest posting, please let me know. I've enjoyed the time I've spent as ChicagoGenealogy. I printed and scanned thousands of records and, sure, after a while some of it became routine, but being able to come up with a hard-to-find record was always satisfying and having a request come in while I was at the Family History Center so I could turn it around in jaw-droppingly short order was always fun. So, what does the future hold for me--besides unpacking lots and lots of boxes? Well, we've got a new version of Genlighten that will launch later this year--simpler and more visually appealing with a few more powerful features--so some of my time will be taken up with that. And then, I'm not sure. I might decide to learn all that I can about genealogy research in Southern California or I might decide to learn to code in Ruby on Rails--something I've always wanted to do. Or I might just slather myself with sunscreen, by myself a porch swing, and work on clawhammer banjo for the rest of my life. We'll see!